Grains are a very old type of food, dating all the way back to ancient times. But a lot has changed since then. For one thing, we have a wide variety of grains to choose from, and for another thing, grains themselves may have changed over the millennia. So, if you want to learn all about grains, and which ones are good and bad for you, you’ve come to the right place. Author of Guns, Germs, and Steel, Jared Diamond, says humans have enjoyed grains for thousands of years – as far back as 9,000 B.C., to be precise. Diamond also adds that humans living in modern-day Middle Eastern countries cultivated what he identifies as “founder crops”, made up of barley, flax, einkorn and emmer wheat. Asian populations grew rice as far back as 4,000 B.C., while corn was enjoyed in Central and South America in 6,000 B.C. So, the next time you enjoy a bowl of rice or a slice of bread, you can remember that you’re eating something that our earlier ancestors sank their teeth into, too. Grains are such a common part of our diet, but few of us actually know what a grain really is. So, let’s break it down, bit by bit. Husk: The husk is the outer shell, and it’s inedible. Therefore, it must be removed before you can consume the grain itself. Bran: The next layer is the bran, which is a cover protecting the rest of the grain (the endosperm, and the germ). Germ: This is the seed’s embryo, and this is what will sprout to create a new plant under the right conditions. Endosperm: The endosperm makes up most of the grain, and this is what nourishes the seed. Therefore, when you see the term “whole grain” it is referring to this seed and its multiple parts. The only part that gets removed is the husk, which as we know is inedible. We’re all familiar with wheat, corn, and rice, but there are so many other grain varieties out there. 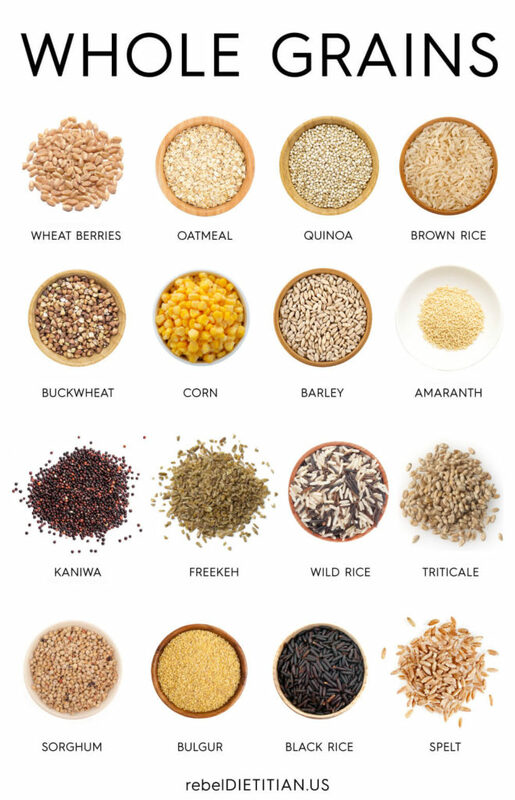 So, here’s a comprehensive list of whole grains to give you an idea of how wide-reaching grains can be. The next time you go grocery shopping, see how many different varieties you can spot. Seeing the different shapes and textures is a fun way to explore this food group instead of just reading about it. Grains definitely get a bad rap these days. Certainly, those with a gluten intolerance or gluten sensitivity need to be careful around grains. And those with autoimmune diseases, such as Celiac or Crohn’s, along with IBS or leaky gut tend to avoid gluten, or grains altogether. However, grains themselves are not inherently bad – after all, they’ve been in the human diet for thousands of years. So, let’s take a look at the many health benefits that grains can provide to those people who do not suffer from an intolerance or sensitivity to them. Bare in mind that this discussion focuses on whole grains, and not refined, processed grains – between the two, there’s a big difference in nutritional and health benefits! Whole grains are a carbohydrate, and they provide the body with a nutritious source of ready energy. Whole grains contain a lot of fiber, which can help to keep you fuller, longer. What’s more, fiber-rich foods help to keep your digestive tract clean and running efficiently. Unlike processed grains, which are stripped of their natural nutrients, whole grains are a very nutritious food, with B vitamins, iron, phosphorus, magnesium, manganese and selenium. Some health experts and advocates of the paleo diet will eschew grains due to concerns over their potential to cause inflammation in the body – specifically within the digestive system and the brain. However, grains are also known to have many significant health benefits, and they’re worth considering. Eating whole grains can help to prevent unhealthy weight gain, and even obesity, thanks to their high-fiber content and their ability to nourish without overloading on calories. Eating whole grains can lower an individual’s risk of developing heart disease by nearly 30 percent. Centenarians living in Sardinia enjoy grains as part of the Mediterranean diet. And Harvard studies can back up whole grain’s positive impact on lifespan. In fact, for those who consumed the most whole grains, there was 9 percent reduction in death during the course of the study. Eating more whole grains can also help an individual ward off the development of type 2 diabetes, according to various studies. However, if you already have diabetes, it’s a good idea to consult with your doctor about eating grains. Since they’re high in carbohydrates, they can send your blood sugar too high. However, certain amounts of specific whole grains may be safe. Perhaps due to the high fiber content in whole grains, they’re known to help reduce the risk of colorectal cancer, too. Therefore, whole grains offer many important health benefits, including cardiovascular and digestive health, not to mention a longer life, too. Of course, it’s important to remember that in reading these health benefits, that eating whole grains alone won’t prevent other illnesses or health conditions from occurring. Good health is the result of many factors, including lifestyle, exercise, and diet. Therefore, incorporating more whole grains into your diet may be a good way to improve your health and prevent dangerous health conditions, too. While there are many different types of grains, the most popular ones are wheat, rice, and corn. So, let’s examine these three varieties to see what their specific health benefits include. Wheat germ is the whole grain, that still contains the wheat kernel. So, to get these benefits, be sure to look for 100 percent whole wheat. Otherwise, the wheat grain will be processed, and also stripped of many of these benefits. Wheat germ is rich in antioxidants, and can help fight against free radicals, oxidative stress, and can also prevent chronic conditions, including heart disease, cancer, and diabetes. Wheat germ supports healthy elimination and regularity thanks to its fiber content, which helps to add bulk to stools and sweep the digestive tract clean. Wheat germ can stabilize blood sugar levels, even in individuals with diabetes, and it can also help to lower LDL cholesterol, too. Rice is controversial. Some argue that it’s an empty carbohydrate without any substantial nutrition and just a lot of starch. While the verdict is still out about white rice, let’s focus on wild rice, and why you might want to swap it for the white rice. Like wheat, wild rice is high in antioxidants, and some studies have found that the antioxidants in wild rice versus white rice are 10 times greater. Wild rice is rich in folate, which is a necessary nutrient for expectant mothers, as it ensures the proper development of the unborn child. And even if you’re not pregnant, folate is still an essential nutrient that can help to prevent anemia, as well as certain cancers and cardiovascular issues. Because wild rice contains a lot of phosphorous, it may also help to strengthen bones and increase bone mass, which can be a very important factor for women who tend to struggle with bone mass density as they grow older. You’re probably used to seeing bright yellow kernels of corn, but corn can grow in many different colors including pink, purple, blue and black. Unfortunately, many corn crops are genetically modified organisms (GMO) and aren’t quite as healthy as organically grown corn. Therefore, when consuming corn, look for organic products to make the most out of this simple, ancient grain. Corn contains vitamins B and C, as well as magnesium and potassium. Corn also has antioxidants associated with healthy skin and eyes. Corn is a fiber and a complex carbohydrate. This means your body will digest corn slowly, and this can prevent spikes in blood sugar, and help to keep you feeling fuller, longer. Not all grains are made equally. And even though whole grains are associated with many health benefits, each variety offers something specific. However, not all grains are made equally. And some should be avoided at all costs. Let’s take a look at some of these “bad” grains. Unfortunately, close to 80 percent of the foods in the American diet contain genetically modified corn. But GMO extends to many other grains, and not just corn. Therefore, unless you’re eating organic whole grains, there is a risk that you’re eating potentially dangerous grains. For example, GMO foods have been associated with serious health concerns, such as compromised gut, antibiotic resistance, endocrine disruption, reproductive system issues, and increased aging. These health problems can occur because you are essentially eating a food which has been genetically modified. Therefore, it’s not the same type of grain that our ancestors enjoyed in Mesopotamia. Many people avoid wheat because they believe they have a gluten intolerance. However, the problem may not be the whole grain or the gluten itself. Instead, the problem may be in the agricultural practices throughout the United States. It’s a common harvest protocol to spray wheat fields with herbicides which contain glyphosate. This toxic chemical increases the harvest, however, it wreaks havoc in the digestive system of many individuals. Therefore, even though whole grain wheat should be a source of nutrition, it can often be a source of digestive distress if it was harvested using this herbicide. Therefore, to avoid this toxic whole grain, look for organic, non-GMO wheat products. You will probably see food in your grocery store marked as “whole grain”, but others not. That’s because many grain-based products are made with refined grains, rather than whole grains. But what’s the difference? If you consume a wheat bagel, if it’s not made with whole grains, you’re likely eating refined grains, and getting nothing more than a quick surge of carbohydrates. Refined grains are stripped of the bran and germ, and you’re left with only the endosperm. This part is basically a carbohydrate-heavy substance without many nutrients. Therefore, if you consume a wheat bagel, if it’s not made with whole grains, you’re likely eating refined grains, and getting nothing more than a quick surge of carbohydrates. Because refined and processed grains are stripped of their nutrition, many grain-based products are fortified. You’ve probably heard about fortified cereals, granolas, and breads. Well, these products are fortified because the original nutrition of the whole grains was taken away, along with the grain’s bran and germ. So, to get the most nutrition out of your meals, look for whole grains, that still contain their original nutrition content. Grains and gluten are not synonymous. In fact, gluten is a protein that occurs in only a few grains, such as wheat, barley, rye, and spelt. Therefore, individuals with celiac disease who must avoid gluten also must avoid these four grains, whether they’re whole, refined or processed. However, this doesn’t make these four grains bad. In fact, there are many people for whom this protein – gluten – isn’t a problem. Therefore, as long as you do not show symptoms of gluten intolerance or sensitivity, and also feel well when including grains in your diet, you can consume them safely. Gluten may be a serious problem for some people, but gluten, like grains, is not inherently bad. The Dietary Guidelines for Americans recommend that adults consume three to five servings of whole grains each day. So, for example, one-half cup of cooked oatmeal constitutes one serving of whole grains. Therefore, you can consume whole grains, just as they are and as a side to your balanced meal. Or, you can consume them via grain-based products, such as bread, cereal, rice, and tortillas. Because grains contain an anti-nutrient called phytic acid, it can sometimes be difficult for people to digest. That’s because phytic acid binds together with other minerals, and makes it impossible for them to be absorbed and metabolized by the body. However, this isn’t a new problem. In fact, grains (as well as legumes) have always contained phytic acid, and our ancestors figured out ways to get around this anti-nutrient. There are traditional methods that can degrade most antinutrients, and these include soaking, sprouting and fermenting. And while that might sound a bit strange, you’re probably familiar with these practices. Take sourdough bread, for example. This type of bread is made with a dough that’s left to sit and ferment for many hours. The fermentation process helps to break down the phytic acid present in the wheat, making it easier for your body to access the nutrients in the wheat itself. Sprouted grain products are available in health food sections of the grocery store, however, these items usually cost quite a lot more. However, sprouting is a simple method that you can easily do at home. All you do is start with whole grains, then soak them to deactivate the phytic acid. Then rinse and drain them, and keep the moist grains in a jar for up to five days. You’ll actually see little sprouts popping out of the whole grain. In essence, a new plant is growing, and this sprouting process makes the nutrients in the whole grains more accessible to the human digestive system. Soaking grains is another traditional practice that makes it easier to digest and metabolize grains. All you do is soak your grains in an acid medium, which can either be a dairy-based acid or a non-dairy acid. Dairy acid bases include whey, kefir, buttermilk or yogurt. Non-dairy acid bases include lemon juice, apple cider vinegar, or even coconut milk kefir grains. By either soaking, sprouting or fermenting your whole grains, you can break down phytic acid and make the grains easier to digest. As you can see, grains are a wonderful food group with many health benefits. By knowing how to prepare your whole grains, and by consuming the right amount, you can support a healthy cardiovascular and digestive system, and also enjoy an ancient food, too.